Honking bus driver reprimanded for anti-Israel protest. I was reading through my copy of this week’s Jewish Chronicle when I saw a piece by Jennifer Lipman. It was about the driver of Bus No 38 who had repeatedly honked his horn as he drove passed Palestine Solidarity Campaign protesters outside Batsheva’s performance of Decca Dance on its first night at Sadler’s Wells. The protesters cheered in response. I caught the honking on film, but thought nothing more of it. I was more interested in hoping that the anti-Israel protesters who disrupted each of Batsheva’s three performances might be prosecuted for aggravated trespass. Obviously that didn’t happen. 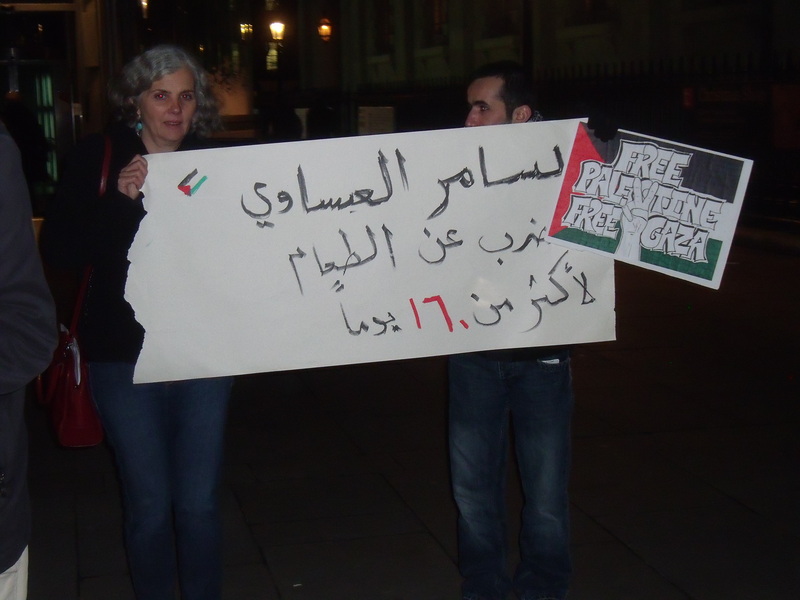 Neither did it happen when the protesters disrupted Habima at The Globe nor when they disrupted the Israeli Philharmonic Orchestra at the Royal Albert Hall. But someone did complain about the honking bus driver. Palestine Solidarity Campaign activist says he wants to kill Israelis. 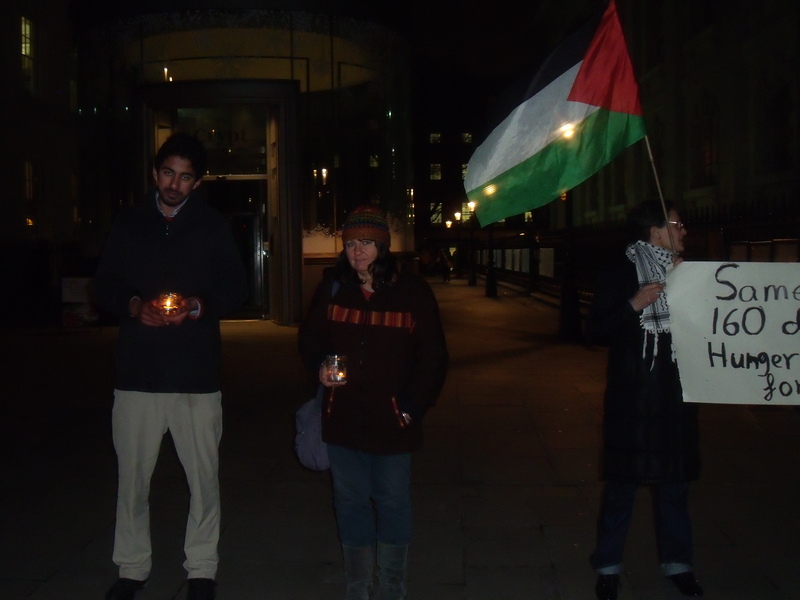 Protesting for Samer Issawi in Trafalgar Square. 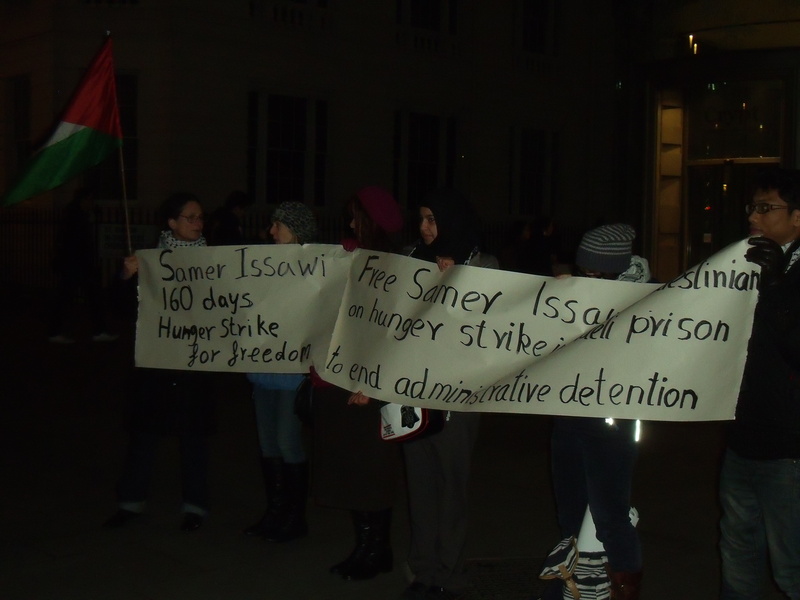 Issawi was released as part of the agreement where 1,027 Palestinian prisoners were exchanged for Israel’s Gilad Shalit. Issawi was then rearrested for allegedly defying the terms of his release that required him to remain in Jerusalem. Issawi was originally sentenced to 30 years in prison in 2001 for shooting at Israeli soldiers entering his village of Isawiya, east Jerusalem. He is a member of the Democratic Front for the Liberation of Palestine and he has now been on hunger strike since 1st August from when he has ingested only water and salt. 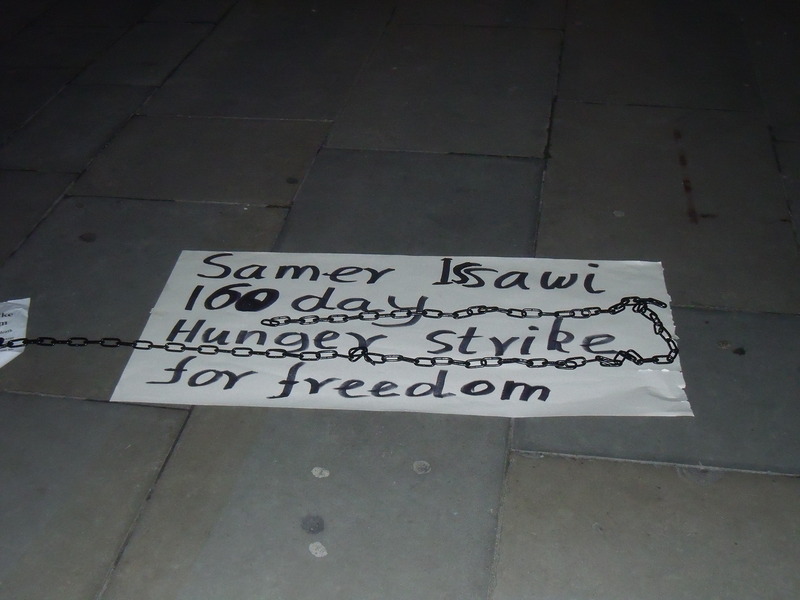 When I arrived in Trafalgar Square none of those demonstrating for Issawi were on hunger strike. It can’t be easy for some of them to give up their daily visit to the local bistro for a bowl of steamy mushroom soup with baguette and a glass of Merlot. Some of the demonstrators wanted to chat with me, mostly telling me that I wasn’t welcome and that I wasn’t allowed to take photographs of their demonstration. I did have a polite discussion with a 23 year old who had just finished studying accountancy. We talked about the history of the Israeli-Palestinian conflict. Needless to say we disagreed on everything but he did tell me of his future plans. 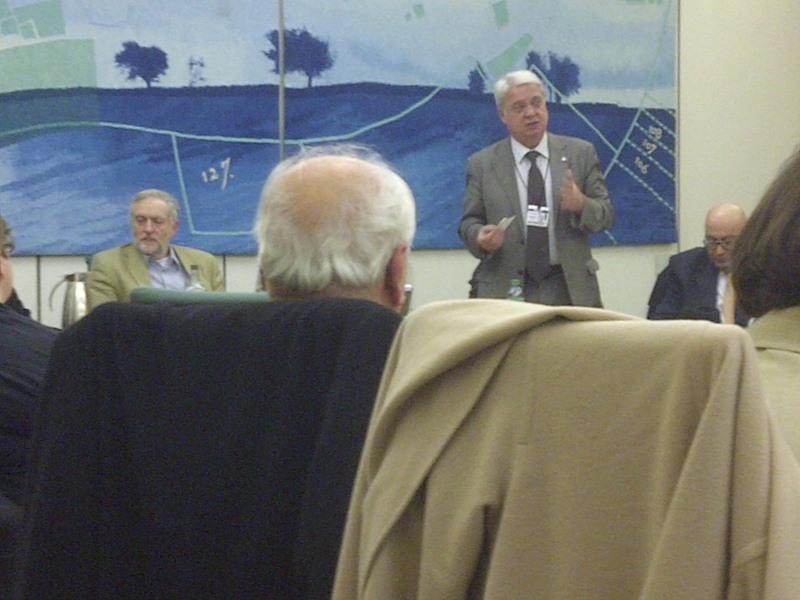 He wanted to leave his family and head to Pakistan to start up a political party that would “bomb the whole of Israel”. This isn’t a surprising sentiment for a Palestine Solidarity Campaign activist as their hate for Israel’s supporters far surpasses any faux concern they claim to have for Palestinians, including Samer Issawi.